Well, things work differently around here. Most fantasy worlds are unrealistic in some way or another, but at least they are reasonable. Wonderland is... different. The details vary, of course, but they are invariably strange places filled with strange phenomena and populated by strange people. But they are not so far gone as to permit absolutely anything - Wonderland still makes sense, but not that kind of sense. Many will have a theme of some sort, especially if there is An Aesop. 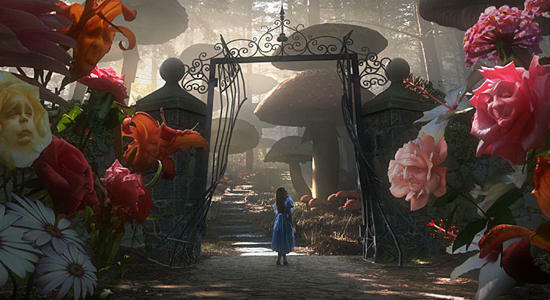 The Mental World and Dream Land are often wonderlands; there is also a certain amount of overlap with the World of Symbolism or the Land of Faerie. See also Cloudcuckooland. A type of Eldritch Location. Compare to Another Dimension, which makes more conventional sense, and the World of Chaos, which makes less. Kamichu! : A little girl waking up one day and realizing she's a god is odd enough. The land of the gods, however, where other gods like Laserdisc God reside, is very Wonderland-like. The Digital World drifts into this on occasion, depending on the continuity and location. The 1950s strip from the Anthology Comic The Beano Pansy Potter in Wonderland. Figment (based on the Journey into Imagination ride) takes a journey into a world of imagination through a mentally projected portal. The Imaginary realm is divided into various provinces of creative expression such as the Color Wheel, Mathmagicland, the Audio Archipelago and the Nightmare Nation, though only the latter two are properly visited. As Blair was the one that created the portal with his mind, he has some influence over reality there and in time gains a full mastery of that gift and his "mental energy devices" to properly become the Dreamfinder. The Nightmare Before Christmas: Although only Halloween Town and Christmas Town are shown, presumably each of the holiday towns is a themed wonderland following their own logic. Labyrinth: The Goblin King's kingdom has a structure (both physically and politically). Reason and logic still work there (assuming you take nothing for granted, and take everything literally). Everything that appears in that world also has a 'real-world' referent. And there are rules and laws, although those rules are—to a certain extent—set by and subject to the moods and whims of the king. The Lands Beyond of The Phantom Tollbooth. Charlie and the Chocolate Factory: The inside of the factory is a candy-themed wonderland that makes perfect sense...if only to its creator. The Hitchhiker's Guide to the Galaxy. After hitching a ride off Earth, every place just gets weirder and weirder. Then there's the Infinite Improbability Drive, which is capable of making reality leave the building. The Wonderful Wizard of Oz: So your house falls down onto a witch, and you meet a talking scarecrow, man made of tin, and lion... the entire Land of Oz is a strange wonderland. The author of the Oz books, L. Frank Baum, felt it made perfect sense, and was offended that it was compared to Alice in Wonderland! Venus in the Robert Rankin book "The Mechanical Messiah and Other Marvels of the Modern Age". Fairyland in The Girl Who Circumnavigated Fairyland in a Ship of Her Own Making by Catherynne M. Valente. Katamari Damacy: The sky broke, and it can be fixed by rolling a sticky ball around Earth to create replacement stars. Rolling around the world, seeing a child riding a panda bear like a motorcycle is not unusual. LittleBigPlanet: Especially owing to the user-created content and the customizable nature of the game. The Fairy Land of Neirutvena in Chains of Satinav is one of these. Among other oddities, the season is determined by the orientation of a painting in the royal art gallery, the direction of the wind is determined by the large-nosed crab creature that acts as a weather vane, and the time is determined by a large peacock who lights up his plumage based on the season and the direction of the wind. Most of the settings of the Super Mario Bros. series falls into this. As most are strange locales populated by strange people and creatures. The mushrooms that increase Mario's size are even a direct shout out to the mushrooms from Alice in Wonderland. The Property of Hate is set in a world where lies, doubts, fears and ideas are tangible entities. The sun fell out of the sky and turned into trees and a ocean rests on top of a forest. Over the Garden Wall is about two brothers who get lost in a strange place simply called The Unknown. Sounds like some Wonderland business waiting to happen, and it does, with elements such as a town inhabited by living scarecrows who are actually the skeletons of the forgotten dead, a school for animals, and a manor complex inhabited by two eccentric millionaires who don't realize their vast, sprawling mansions abut with one another and spend years thinking the other is a ghost. The Rick and Morty episode "The ABCs' of Beth", has Beth recount how she and her childhood friend, Tommy, used to play in an imaginary place called Froopyland as a way to cope with him being murdered and eaten by his father. When he overhears her, Rick becomes indignant and takes her to Froopyland to brag about how good an inventor he is. In Froopyland, they discover that after decades of being left there, he went mad and became the de-facto incestous cannibalistic ruler. Rick and Beth fight over Froopyland, with Rick telling her that he created it because she wanted him to make weapons to terrorize, and murder, the neighborhood kids, and Beth snaps back that the reason she asked for those things is because knowing what Rick's capable of, she wanted some attention from him, and the reason why she left Tommy in Froopyland is because she was jealous of the fact that Tommy had parents that loved him and paid attention to him. When she goes back for him, she refuses to apologize for how he got stuck there, and after killing him and his subjects, she asks Rick to clone him, and save his father's life. The universe as described by quantum physics and special relativity make very little intuitive sense to us feeble-minded humans, but both systems adhere to strict mathematical premises and make internal sense. Although logic as it appears in dreams tends to shift erratically from moment to moment, in any given moment there is usually some underlying logical structure that the narrative of the dream is following. To early people, any far away land or sea would be like this. Especially when they've only heard about them from others who managed to explore such places. An example would be Australia for European explorers. To them, it was a strange place where there were giant rat-like animals that hopped on two legs and had pouches, beaver-like animals with duck bills and where the swans were black instead of white. Our own world would seem like this trope to a human suddenly perceiving it through Bizarre Alien Senses, and presumably the same would be true for a creature with different sensory abilities that found itself seeing, hearing, or otherwise feeling its environment in the way we do.